Most provincial and territorial health insurance programs cover prenatal blood screening for chromosomal anomalies (Down syndrome and Trisomy 18) and neural tube defects. The programs usually include provincial coordination of education and evaluation, and participation is based on individual choice. It appears that participation is influenced by the preferences of both healthcare professionals and women. 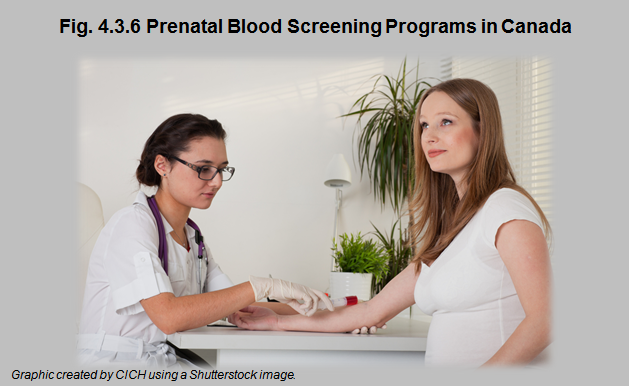 Individual provinces set their own policies regarding which prenatal screening blood tests are used for their program. This choice is partly determined by access to adequately equipped and staffed ultrasound facilities. • Down syndrome, where a person has 47 chromosomes instead of the usual 46 – an extra chromosome 21. • Trisomy 18, where a person has a third copy of chromosome 18, instead of the usual two. • Neural tube defect, where there is an opening in the spinal cord or brain that occurs very early in development. Prenatal screening results may cause mixed emotions for women and families, including stress, anxiety, relief, guilt, and questions about with whom to share the information. It is essential that women get professional genetic counselling to provide psychological support and to explain the results. The support should involve health professionals, including medical geneticists and genetic counsellors, who are knowledgeable about the challenges and limitations before, during, and after the screening. Families need this support since the decision to undergo prenatal testing is a personal choice based on values and experiences. Some families will want to know about genetic risk in order to prepare for caring for a child with a genetic condition, some may want the information to help them to decide whether to carry on with a pregnancy or terminate, while others may want the information to plan for future pregnancies.